Determines the number of actions retained by the Undo list. By default, 50 actions are stored in the list. You can alter the number if you want to. When you work with Storyboard Pro, the OpenGL drawings are loaded in the cache to optimize the display and playback. You can increase or decrease the number of drawings loaded in your cache. The default value is 20. When you draw in Storyboard Pro, the strokes are vectorized as you go. When you release the drawing tool, the lines are vectorized. When you quickly sketch a numerous series of lines, it may happen that the vectorization process interferes with your drawing action. To avoid this, you can delay the vectorization process by increasing the delay value. When you modify a drawing, the thumbnail displayed in the Thumbnails and Timeline views are updated. By default, the update process is delayed so it does not slow down the application while you draw. The lower the number of milliseconds, the faster the updates and vice versa. Generates antialiased mipmap textures. Deselect this option to increase performance when working on bitmap layers with non-standard graphics cards. Mipmapping can cause some issues with lower-end video cards. Improves the appearance of vector brush strokes that use bitmaps for the colour or opacity, such as a vector drawing layer, vector brush with texture applied. Lets you see smooth lines as you draw, as well as an antialiased drawing area. You can change this value to fit the current level used in the Stage view. By default, this option is deselected—see Antialiasing OpenGL Lines. Lets you enter the number of samples used for the antialiasing process. The number of samples is equivalent to the number of times a pixel will be enlarged to calculate the antialiasing. This is called supersampling. The higher the number of samples, the better the antialiasing quality, but the longer it will take to calculate. The default value is 4. Allows drawings to be loaded in the background while playing back a panel. This way, playback is continuous. You can specify the number of concurrent drawings loaded at the same time. This should be set according to a machine’s number of cores. 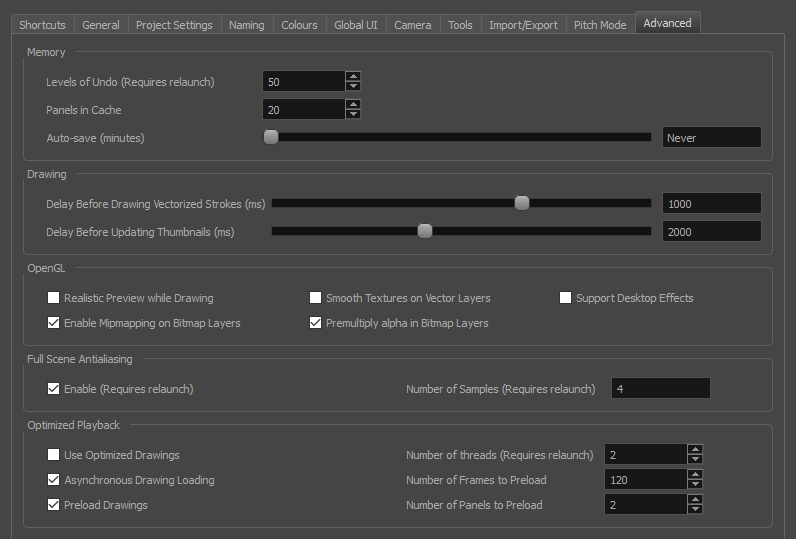 Defines the number of drawings or panels to load during playback. Storyboard Pro looks ahead for the number of frames, and checks to see how many drawings are used. Each layer on each panel is a drawing. If you have many short panels, then you will have more drawings than if you had one long panel. Storyboard Pro looks ahead for the specified number of panels to determine the number of drawings in those panels. Keep in mind that each layer on each panel is a drawing. If you have long panels, then it will want to look ahead several panels, instead of the specified number of frames.